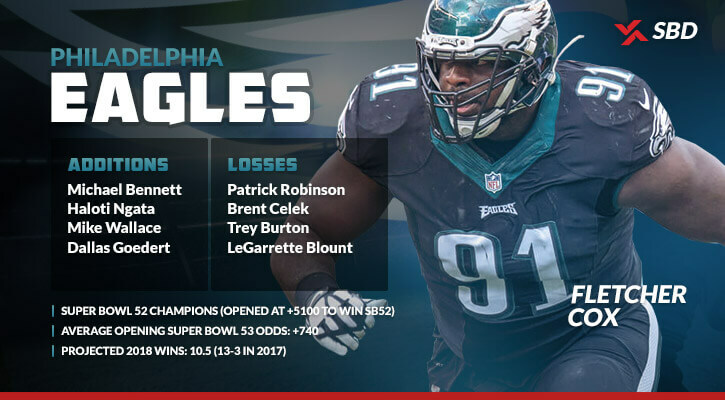 Looking for current Super Bowl odds? 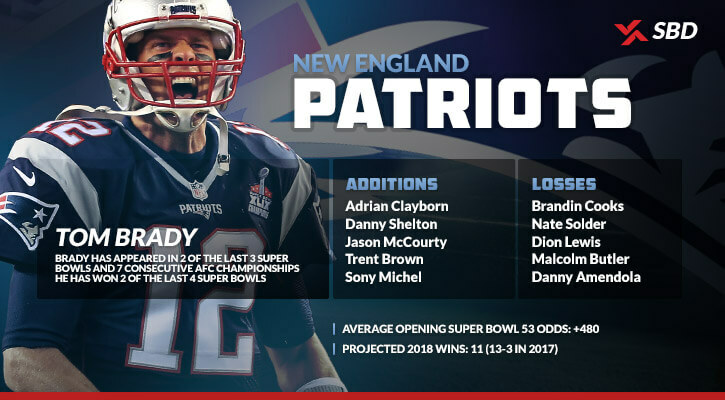 The New England Patriots got off to a slow start in the 2018 NFL season, seeing their odds to win Super Bowl 53 take a bit of a tumble. We tracked the Super Bowl 53 odds for all 32 teams in the NFL all season long, from the moment they become available right up until kickoff of the Super Bowl. The graphs below are generated by averaging the odds from multiple sources and will be updated after each week. Since the Patriots defeated the Chiefs, 43-40, on Sunday Night Football of Week 6, New England remained the favorite among AFC teams to win Super Bowl 53 until Week 10. The Chiefs were favored the rest of the way, except for the week following Week 13. The New England Patriots have now represented the AFC in four of the last five Super Bowls, winning three of them. The Buffalo Bills were the last non-Patriots AFC East team to play in a Super Bowl, dating back to the 1993 season (Super Bowl 28) when they lost in their fourth consecutive appearance. The Bills, New York Jets, or Miami Dolphins made their intentions clear, though, this season: they don’t want to compete against Brady anymore, opting to rebuild for his retirement. Betting sites strongly believed the Pittsburgh Steelers would claim their third straight AFC North title when odds opened. The most interesting story in the division, though, was the heightened expectations of the Cleveland Browns entering the season. The Browns did not have the longest odds to win the Super Bowl in the division to open the season, as that honor went to the Cincinnati Bengals. It didn’t take long for things to change back to normal, though. Only one team in the AFC South has ever won a Super Bowl: the Indianapolis Colts. All seven other divisions have at least two Super Bowl-winning teams. But both the Jacksonville Jaguars and Houston Texans appear to be taking the proper steps towards changing that. Of the eight divisions, the AFC West was expected to be the most competitive in 2018. But a red hot Kansas City Chiefs team and some awful performances from the Raiders and Broncos certainly changed that. One interesting note on the Raiders: since moving back to Oakland (from Los Angeles) in 1995, the franchise has not won a Super Bowl and has only made the playoffs four times in those 24 years. The NFC race looked very interesting after the Los Angeles Rams suffered their first loss of the season in New Orleans. The Saints pulled awfully close to the Rams, while the Vikings, Panthers, and Eagles all remained threats early in the season. That changed quickly, though, as the Vikings and Panthers quickly fell out of legitimate contention. The NFC East can thank the Philadelphia Eagles for winning their first Super Bowl last season, which gave the division the great honor of being the first with four Super Bowl winners. The Vikings and Packers have not entered into a two-team race in the NFC North as we all expected. Instead, the Bears led the division, as the Packers and Vikings both missed the playoffs. The NFC South sent three teams to the 2017 NFL Playoffs, with the Tampa Bay Buccaneers serving as the odd-man out. This looked like it could be the case again in 2018, but the Panthers and Falcons fell out of contention quickly over the second half of the season. The New Orleans Saints joined the Carolina Panthers as the only teams to repeat as NFC South champions. The Panthers won it three years in a row, though, from 2013-2015. For the first time since 2012, the Seattle Seahawks did not open the season with the shortest average odds to win the Super Bowl among NFC West teams. Seattle dismantled the defense they have hung their hat on over the last seven years, but the unit still performed at a great level. Russell Wilson made just enough plays to get the Seahawks back into the playoffs in 2018. If we judge based solely on the average opening odds for each team to win Super Bowl 53, the AFC would have two new playoff teams in 2018. With Deshaun Watson and (most likely) Andrew Luck returning, betting sites did not like Tennessee’s chances in the AFC South. And after the Bills miraculously ended what was the longest playoff drought in the four major North American sports last year, sportsbooks certainly did not feel trading away Tyrod Taylor was a move in the direction of making it back-to-back playoff appearances. According to the opening odds, we were just be swapping out the Carolina Panthers for the Green Bay Packers on the NFC side of the 2018 NFL Playoffs. Had Aaron Rodgers not gotten injured in Week 6 of the 2017 season, it’s likely Green Bay would have been a part of the 2017 playoffs, as well. Quiz: Can You Spot the Fake Super Bowl Props?